Most of the US economy is driven by consumer spending versus B2B or BtoG (government), so B2C commands the lion share of ecommerce and digital marketing spend. But as this B2B digital marketing recruiter looks back on 2016, fully half of the searches I conducted this year for ecommerce and digital marketing leaders were B2B, and in fact, in the current 4th quarter all of my searches are B2B except for one. B2B companies are increasingly leveraging digital capabilities to empower sales and enhance their customer-centric mind-set. According to Forrester Research, B2B ecommerce companies generated nearly $800 billion in 2015, and they expect that exceed one trillion by 2020. The rapidly growing adoption of B2B digitization is generating huge benefits. One example: A client that I worked with this past year credits the hire of my VP of Marketing candidate for a nearly 20% increase in conversion rates. That metric alone will pay for my candidate’s salary ten times over, not to mention the search fee for utilizing a B2B digital marketing recruiter. 2- Use of data. Anyone who’s in B2C digital marketing and ecommerce is already data-centric, and it’s no less crucial for B2B’ers. In a recent search for a wholesale distribution client, I asked the President what they knew about their customers. I was somewhat amazed when the President looked at this B2B digital marketing recruiter and asked, rhetorically, “What 360 degree view of the customer? We’re somewhere around 10 degrees, and we need to change that.” Roger that, and I told him he wasn’t alone. Most of the B2B companies I work are mostly on the side-lines when it comes to using advanced analytics to operationalize a customer-centric strategy. That’s exactly why this is on my top three list. Being data savvy is mission critical in generating new insight about customers, create more targeted marketing campaigns and helping commercial sales reps better qualify prospects. 3- Smooth cross-channel integration. Did you know that the average buyer uses a half dozen different channels of communication with B2B companies? Mobile is among them, yet many B2B clients I work with admit they lack a mobile strategy. Then there’s email, social, search, blogs and many others. 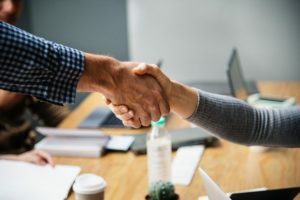 You want a candidate who understands how your customers buy, and knows how to integrate CRM to manage relationships with prospective customers as well as new ones. Jerry Bernhart, Principal of Bernhart Associates Executive Search, LLC, is one of the nation’s preeminent and veteran executive recruiters in ecommerce, digital and multichannel marketing, and CRM. With 100 published LinkedIn articles, Jerry is the “voice” of best practices in the recruitment and hiring of ecommerce and digital marketing professionals. Jerry is also the author of the critically acclaimed book, “Careers in Ecommerce and Digital Marketing,” on Amazon, and participates in many leading digital marketing and ecommerce conferences. Jerry has been recruiting and placing marketing professionals for more than 28 years. Check out Jerry’s other insights on the Thought Leadership section of the Bernhart Associates website.